At a time when trust in politicians, in pretty much all countries is eroding to the point it may never return in a meaningful sense, it is refreshing to say the least, to be made aware of how politicians can and still serve the public good. What a fascinating life Dennis Skinner has led. And we are shown this life, through library footage of and interviews with not just the man himself, but his younger brothers (there are 5 in total) and those who’ve had the chance to meet him as constituents. Unashamedly socialist, the “Beast of Bolsover” was raised in a political household – politics morning, noon and night – and in a typically working class environ; outside toilet, no hot running water, barely two pennies to rub together. Such was the extent of the poverty when growing up, he knew by age 4 or 5 that Santa didn’t exist; and not because he was told, but because he knew there wasn’t any money to buy the presents for Father Christmas to deliver. 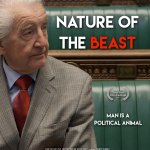 The first part of the film is pretty much run of the mill, but really hits its stride in the last hour, where we leave his childhood behind and get to learn about his rise through politics to being elected MP for Bolsover. A fierce reputation gained at local council level, Denis Skinner then made the inevitable move to Westminster, representing the Labour Party in the constituency of Bolsover, where’s he’s been incumbent since 1971. Notable in a long list of achievements, his defeat of a ruinous Housing Bill, using the parliamentary tricks of the trade and confounding those who sought to push the bill through. However what I took most away from this was more his steadfast belief in the good that socialism can bring to a postmodern, post-industrial world and doggedly sticking to his guns. One look at either series of House of Cards tells us that one’s own ideals are easily and readily compromised in the political sphere – neatly summed-up with the word of “patronage”. Consequently, he never took a ministerial position in a Labour government, despite being offered, and preferred to serve his constituents. As much as I love his refusal to back down and his frankly hilarious “trolling” of the Queen, it’s his pride in representing the working class that will remain with me most. I think, in conclusion, that there are two ways we can appreciate such a man and such a documentary. We can despair at how someone’s motivations, persona and ideals in fact don’t earn them the higher profile roles and in fact, only serve to reduce their public profile, in the case of TV appearances. Or, we can admire someone’s stand and gumption, their fighting a cause they believe in and being incorruptible in this pursuit. Nature of the Beast is released September 8th and the trailer is below – do check it out!